We've previously covered the aquisition of resources with interstellar hydrogen harvesting and mining ships, but those raw resources need to go somewhere! Refining such a large volume of material can be done at any scale, but the largest and most stable fleets of craft have dedicated ships for the purpose. The refinery ship is a very energy intensive craft, capable of processing extreme volumes of materials. Traditionally, they were used to maximise delivery speeds when moving materials from one world to another, but post-Maelstrom, they are used by the richest and most powerful groups as part of their great nation fleets. 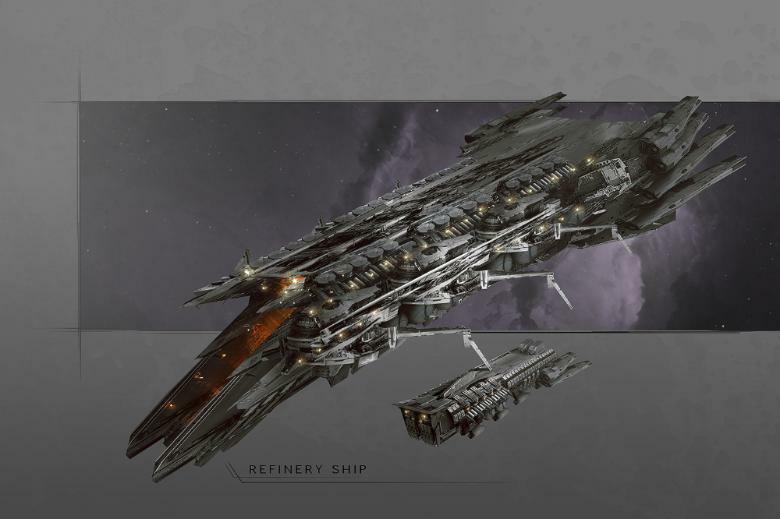 Most commonly seen amongst Epirian franchise HQ fleets, refinery ships grant almost unlimited range within the galaxy, and therefore represent that most precious commodity - long term safety.